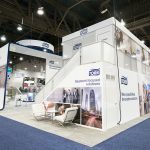 Re-Configure Existing Booth to give it the look and feel of an entirely new exhibit. Open up the booth to be more inviting. Highlight existing product display vignettes. Create fully air conditioned conference rooms that were also sound proof. 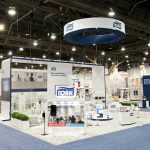 Create a display area in the center of the booth for a new product launch called PeakServe to be unveiled by VP’s at the show. Accentuate blue corporate colors and update branding from SCA to Essity. 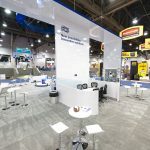 Redesigned the booth using 90% of existing components while still conveying the look and feel of a new exhibit, important to a company which prides itself on sustainability. Reconfigured & repositioned the structure to create a more open, inviting space, focusing on the main aisle. 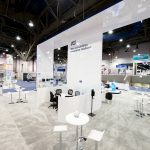 A larger, open meeting /presentation/entertainment area section was created in the forefront of the booth. Added seating areas and a semi-private conference room with its own demo area. Kiosks/Vignettes of restrooms were updated with new Essity/Tork product and resurfaced with updated tiles/facades. Insulated the walls and ceiling of the conference room. Installed (4) Air Conditioners and Duct Work. Added Pyramid Studio Tiles for sound reduction. The upper deck conference room windows were dressed with window perf. Added a hanging sign for increased show floor presence and visibility. The pleasing smell of hot cinnamon rolls and espresso served created a draw to the booth. Changed any SCA graphics to Essity. 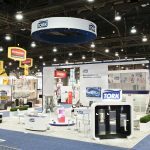 The Tork product was the focal point, promoting the brand versus the corporate name.